1. Anyone think the Patriots don't want to dismantle the Colts here on National TV? Deflategate was front and center based on the playoff game last year between these two teams. 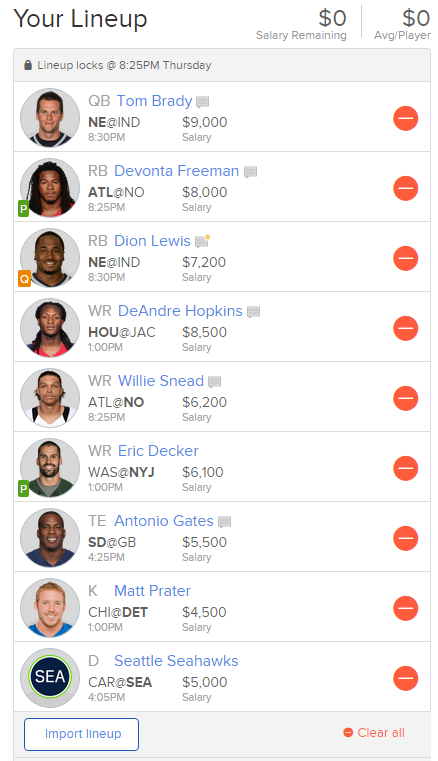 I could not get Gronkowski in the lineup, but I think the hedge of Brady / Lewis works great. This has the highest under/over at 54 1/2. Someone might eventually stop this high flying offense, but it won't be the Colts defense this week. 2. If you are playing on Thursday and don't have Freeman and Snead in your lineups, you are paying the rake this week. Chalkiest plays of the season. 3. Although I suspect the Texans will start throwing less with a healthier Foster on their roster, I doubt it starts this week. Hopkins is sucking up the targets at such a ridiculous clip that fading him will likely be at your own peril. 4. Gates was not rusty. The Chargers will likely be without Steve Johnson in a game that has a 50 1/2 over / under. Gates is the tight end for all those not somehow fitting Gronkowski in. 5. I run a special indicator for defenses. It LOVES Seattle here. It also loves Tennessee for those more adventurous. 6. I am not in love with Decker here, but his price is right. 7. Matt Prater is cheap. Not worried about Lewis' sudden Questionable status? Not really. It kind of came from nowhere and he is still practicing. He wasn't hurt last game. Is this your biggest investment in a specific lineup to date? Thanks for the Seattle tip! Biggest Thursday for sure. I have had some pretty large Sunday lineups. Awesome - good luck to you! Really love the DFS stuff this year as I've moved away from traditional FF. I've been a FBG subscriber since 2001. Just wanted to say thanks! Good stuff Ike. I find myself more of a DFS player these days as well. Are you diversifying at all or just rolling with this one line up? I just have this one lineup at the moment. 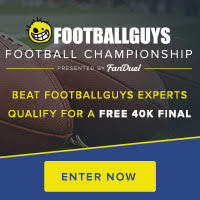 David, when you are doing your cash game research and selecting your shortlist of players how liberal are you with the criteria laid out in the Cracking Fanduel books on player selection? One example where this could be hard is the Quarterback criteria of selecting players projected to hit 2.1x of their salary AND playing in a game with over unders of >= 50 2 weeks ago when there weren't any games on that slate with high over/unders. Do you just adjust that number down to whatever the highest 2 or 3 O/U's are for the week? Do you have a threshold for team total that you use instead? Maybe just comment on how closely you abide by these criteria and if you make exceptions, what qualifies in a cash game. I studied last year to try and crack the positions and help guide players into what worked last year. This year the under/overs have been mild, FanDuel tweaked some ranges, etc. Everything in the book isn't matching up exactly like how it was. It's a constant tinkering. I rely heavily on my projections (and backup data). But most people don't do the work I do every week when setting rosters. Hence the quick rules to guide players on what worked last year. In a few weeks, I am going to tackled the results and see if the messages are still on point or if they need to be modified slightly. 2.) Set up excel filters to see how each player set for the week meets the player selection criteria. For example ignoring the @ home criteria for WR's(which would eliminate Hopkins, Fitzgerald etc) and just picking favorites. Still, I think the books serve as a great way to get your own process started and is still holding up if the player is willing to put some thought into tweaking it each week. Are you swapping the two Thursday players out for Sunday? Or will you be redoing the entire lineup for Sunday? Redoing the whole thing based on new information. I will look to get Mike Wallace into my lineup if it's a given he will play.